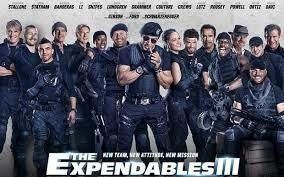 Just viewed The Expendables 3, and I can remember the entire script even after only one watching. "He's one of us. We gotta break him out. You in?" "We gotta new job. Got your guns?" "The bad guy . . . ain't he supposed to be dead?" "He needs to be. Let's do it." "That SOB's got half our team. We gotta get 'em back. You with me?" It's OK to mute this movie if things blowing up get too loud. Any dialogue you imagine will probably be better than the original. Or you can just read lips. Yo.